Real Estate Business Solutions: [Guest Post] : How Does Cloud Based CRM Works for Real Estate Business? [Guest Post] : How Does Cloud Based CRM Works for Real Estate Business? Around few years back, the real estate industry in India was desperately hungry for a change. Lack of centralized work environment, absence of virtual communication system, need for smarter client retention program and image building actually required the industry to welcome a reform. After a few years, thanks to technology, it feels better to be a consumer and prized to be a property consultant. This is a brief article covering how cloud telephony technology and how it’s with CRM solutions is acting wonders for real estate industry. How Cloud Telephony with CRM Solutions is changing Real Estate Industries? In real estate industry, cloud telephony acts as a smart cushioning to wither away the wrongly measured techniques of an existing campaign. With virtual communication and interactive voice recording system, you can connect with your audience flawlessly, understand their personalized behavior and accordingly plan your real estate business to gain more leads, and maintain a holistic customer retention plan. How Does LeadNXT Works for Real Estate Business? LeadNXT is your trusted provider of a set of virtual technology and new media solutions. 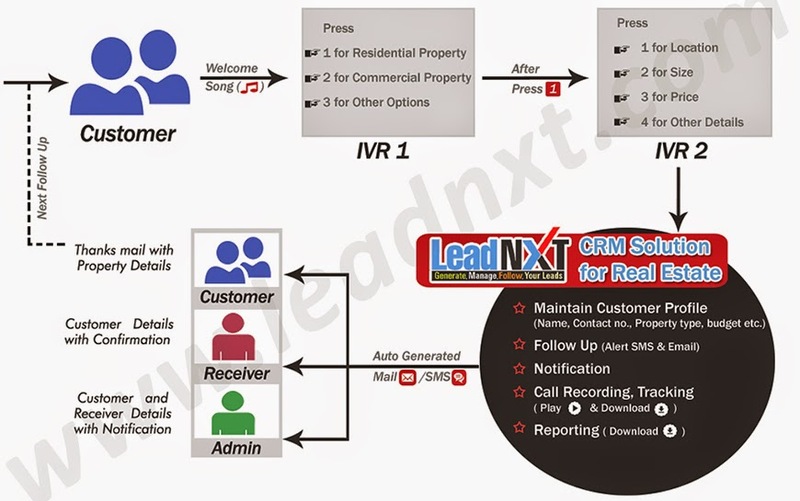 LeadNXT CRM helps you counter customer issues, grow your real estate, helps you manage and maintain to generate leads. IVR Solution - Provide the callers with an easy-to-use interface that consist of menu, which will guide you on how to gain information, the caller just have to choose the type of service he/she wants and the call will be directed to the receiver. CRM Solution - Let you access all the customer data and keep a track of all the sales leads. Our CRM Solution is effective and tailor-made to makes your complete real estate process automated and make gain business productivity. It efficiently monitors all the business activities and send the email alert to the admin and the receiver with the call details. Why should go for cloud based CRM solutions? How much is the overall cost of this solution? Cost of installing and managing cloud telephony depends on a range of factors. The scope of work, time required to install and manage, size of operation etc., matter. So, technically you need not to worry about cost because cloud telephony is a cost effective alternative to traditional expensive CRM solutions. Who is the best cloud telephony company in India? If you consider by reputation, features of product, and history of customer service, you can count on LeadNXT. To book a call with customer care executives for a sample, please contact. Fantastic post, You give a nice thing. Thank you for such a nice Blog. RealERP is the best development firm....great! Helps you manage your Residential Units and...Visit this page! I am happy reading your blog, I gained a piece of knowledge. Kindly continue the work.